Geo Mail (it is a mobile link - iPhone, Android, Samsung) provides an email form where you type your message title and body and choose whether you want to include a link to either a scrollable or static Google map or just your latitude and longitude. When you hit the "Send" button GeoMail opens your device's default Email app with the message and location information pre-populated, all you have to do is specify the recipient and send the email. P.S. Also check out our Geo post mashup here. Mobile mashup Big map has been updated. Mashup implements a new way for sharing location info to mobile users. This web application offers a full screen map with some marker pointing to the current position. Initially marker will be placed automatically but you can of course drag it to the new position. And as soon as you click on it, you will be able to send a link to the map via email and SMS. No registration, no passwords etc. Just send (share) a map. And do it via the standard messaging. Also gmail.com users can Buzz own locations right from the map. Also you can bookmark locations in your mobile browser. Just hit a link within the info window. And bookmark the opened page. http://mbigmap.linkstore.ru (it is mobile site). You can copy this link right to your mobile from QR code on the left. Also you can use this short URL http://bit.ly/7zu3iY. It works on iPhone, Android and S60 phones. A great presentation from Twitter about NoSQL usage. Our mashup Mobile maps in MakeUseOf review. XPath taglib from Coldtags suite let you perform XPath requests right in JSP. See updated version here. You can see local photos as well as search them by the keywords. It works on Android, iPhone and S60 phones. Mashup builder with YQL and XPath. Very interesting and simple stuff. P.S. For web applications you can use the following component Session size tag. It lets you calculate memory size for the sessions. An interesting idea: website-less websites. Everything is just an API. And clients display data via API's. To make it more difficult for spam bots to "collect" email addresses from your page you can use this "scrambler" that turns the email address into its ASCII code equivalent - see MailTo taglib in Coldtags suite. Java servlets filter lets you produce QR code for any URL in your web application. Just add .qr suffix for any URL and get QR code for it - QR code filter. So with this tool you can mobilize your web site automatically. "The research findings show that 19% of tweets contain a mention of a brand. Of the branding tweets, nearly 20% contained some expression of brand sentiments. SnapIt Screen Capture - capture anything you see on your PC screen! Don't waste time cropping your captures. Take a "snapshot" of anything exactly what you need, with just a click. Analysts, Technical Writers who have to describe interfaces, menus, buttons, etc. Lets you save files in BMP, GIF, JPEG, PNG and TIFF formats. 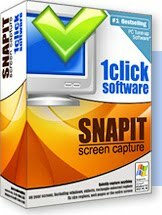 Actually is a good replacement for the combination Shift-Print Screen + Paint we are using for creating shapshots right now. It is obvious, that the question "where are you" is one of the most often asked during the communications. A huge amount of mobile services is actually being built around this question so their main feature is user’s location exchange. 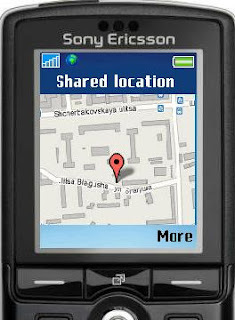 In the most cases it is implemented as the ability for the mobile user (mobile phone owner) write down own location info in the some special place (special mobile application). But it means of course, that user must be registered in this service (download some special application). And even more important – everyone who needs this information must use the same service too. Signed geo messages project presents a service for the mobile Internet and Smart Cards Web Server (SCWS). This service lets mobile users automatically add a special signature to the outgoing messages (email, SMS). And that special signature presents geo information for the current position of mobile terminal. So this service is probably the easiest way for sharing location information. It does not require any downloading or registration from the potential users and provides a smooth extension for the existing communication services. The main idea behind this project is how to deliver location info via the standard messaging (SMS and Email). We are using the same approach all SMS delivery services are in. Typically, when the mobile users get some service via SMS it means he/she is getting actually some link within the text message. This link leads to the downloading service for pictures, ringtones etc. And this approach uses the simple fact that all native SMS clients nowadays are smart enough to discover links (just http://something_is_here text chunks) within the text and allow one click internet access (opening that link). So for our location related stuff we are using the same approach. The location info will be presented as a link, leads to the appropriate map. So if the sender will be able to automatically add such a link to the message, the receiver will be able with one click open the map showing sender’s location (or open some mobile web page with the map – see below about the landing page). Now we are ready to describe all the steps in our project. 1. The location info could be requested right from the sim-card (smart card) as Cell ID info. This information exists always and Java-card applet can read it (local info). 2. Cell ID information could be translated into "human"-readable form of (latitude, longitude) pair. There are several public services over the Net that let us do that. In our project we will use http://opencellid.org service. This service is free and provides a public HTTP based API. 4. URL shortening service. In order to make sure our geo-related URL’s comply with SMS restrictions (simply – they are no more than 140 symbols) we can deploy URL shortening service and make our signature smaller. In our application we will use bit.ly shortening service. This service is also free and provides a public API. So as soon as the mobile user will hit one of the link the native (it is very important!) messaging client (e.g. 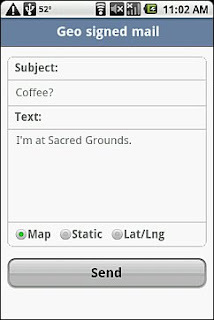 the native SMS client) will be launched with the text (body) field pre-populated with the given URL. So it is enough just to select the target phone (address) from the address book, add some text (optionally, of course) and send the message. Signed geo message service offers a mobile web mashup lets users add a link with geo information to messages (SMS, email). So our signature is a text. And this text simply contains a dynamically generated link that leads either directly to the mobile map or to some landing page where mobile map is a part of it. And that mobile map (visible area) shows the current position of the sender. It is where the name of service is coming from – signed geo messages or geo signatures. This service is actually a web application from the start to end. Service starts from SCWS code that requests local info from SIM card and ends with dynamically generated web page for sending messages. Service converts Cell ID info obtained from the smart card to geo coordinates via the public service. Actually there is more than one public alternative for doing this job. For sending messages service deploys native clients from the mobile platform. It is actually a big plus because there is no need for users to study new application and all the existing address books will be available. Now let us see how our "geo signature" looks like. 4. Upon receiving the request external service creates own URL to the landing page, shortens this URL via public URL shortening service (e.g. http://bit.ly with public API) and responds with the "messaging" screen. This messaging screen contains in the general case just two links: for sending email and for sending SMS. Each link actually contains an appropriate URI scheme: mailto for email, and sms for SMS. In the both cases shortened URL is a parameter. 5. As soon as our user hits one of the messaging links the native client (for SMS or email) will be opened. And the body field will be pre-populated (pre-filled) with our short URL. 6. Now mobile user selects target address (phone) from the address book, probably adds more text and sends the message – everything is done in the native SMS client for example. 7. As soon as a message is received at the target party, the short URL in the text could be opened and our landing page (on the external service) gets a request. Landing service parses the parameters, request the OpenCellID service and gets the (latitude, longitude) pair. Service requests a map via static Google Map API (it is actually just an image) and dynamically composes the response. This response contains a map (just an image from the technical point of view) and (probably, optionally) an additional info. This additional info could be a geo-targeted advertising for example. Such a response is actually a response the target party will get back after opening the "signature". 2. As an extension the previous option some kind of the emergency service could be created. We can send local info (cellID, mcc etc.) as a text (as is), leaving the interpretation of this info to the target party. If our target party is some application (application that will accept/proceed incoming SMS for example) the data could be easily extracted from the text and converted to the geo-friendly form. There is no landing page at all. 3. As an another extension to the “no Internet case” we can try to implement some kind of pseudo-shortening service right in SWCS Servlet (e.g. base 36 encoding) and shorten the URL to the landing page right on the mobile. So the landing page will be used in the short form. 5. The messaging screen may have just one link (for SMS or email communications). E.g. in Russia the mobile email is not popular actually, so the SMS option is quite enough. 6. Many blog platforms (e.g. Posterous, Blogger, Friendfeed, Wordpress etc.) could be actually updated right from email – you have just to send email to some service address for posting new data. So this service could be pre-configured for posting data to some blogging platforms. The first step in the above described chain is SCWS Servlet that requests local info. 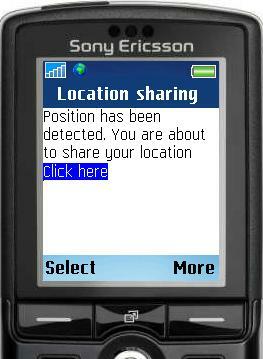 We mean here proactive command Provide Local Information, with Command qualifier '00' (as per GSM 11.14 standard). This command lets us obtain Location Information (MCC, MNC, LAC and Cell Identity). So it is up to our servlet requests this info and use its data for the output. <p>You are about to share your location. In other words this link lets us pass the data obtained from proactive command Provide Local Information to the external site. So here is just two links (or one if we need SMS only for example). And each link contains an appropriate message URI with our packed map URL. As soon as some hyperlink is clicked an appropriate native client (e.g. SMS client) will be fired. And text (body) field in our message will be pre-filled with our short URL. So we can select target phone (email address) from the address book and send the message. This schema works absolutely similar when we drop URL shortening. URI for messages will simply use the real URL. In case of the landing page (see above) the schema includes one step more. As soon as Google Maps URL is composed our JSP page writes a personal location information page for this request. Mashup just creates an unique public accessible file on our server and URL for this file is exactly the same URL we will use in messaging. We can make that URL shorten with bit.ly service or use as is, but anyway it will be used in our messaging URI. Here is simply an image tag that shows the map. Center of the map corresponds to the giving location and below that we place any geo-targeted info (e.g. advertising). It is a key point – this information is geo-targeted, because we know latitude and longitude when rendering that page. In this case our JSP mashup simply creates that page during the request. JSP file physically writes the above-mentioned content to some new file with unique name. And URL for this new file is our new geo-signature. We can shorten it or keep it as is, but anyway this URL will be passed to the messaging link instead of the direct Google Maps link. Mobile messages are probably among of the oldest and most widely used mobile services. So there are no barriers to use it. It means that adding some new features (automated adding) could be adopted without the problems. And of course new features could add a new breath to the old services. The proposed service is really cross platform. And it could be attractive for the mobile operators too due to high profitability of SMS. Service proposes a new way for the location info exchange. And what is important here that service does not introduce a yet another location sharing application. Service deploys existing and very popular channels (e.g. 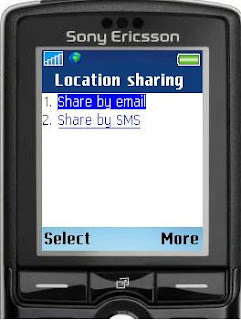 SMS) for sharing locations. So there is no need for end users to study something new. Because the geo signature has been added automatically this service could be easily extended. For example: some application that periodically sends SMS with user’s location to some service number etc. And we think that geo messaging service could increase mobile messaging traffic in the networks. As seems to me it is a great idea: "Last week, Nokia’s BetaLabs released this experimental application called Nokia Bots. Nokia Bots is a collection of four mini-apps which work in the background (that is: while you are using or not using your mobile) and learn about how you use it; and then present options or simply respond to how you’d use your mobile." - from here. It is a real way to make smartphones really smart. QR code servlet in JSOS has been updated. Just a wrapper for Google Charts API lets you cache data for the performance. Runs on Windows, Linux and Mac OS X. Gephi is open-source and free. Really great. Top 10 Open-Source Platforms to Build Your Own Social Network - from here.